Have you seen a mouse? Mice? Rats? The Pest Force has the solution. A mouse can enter your home through an opening the size of a pen cap! A rat only needs 1/2” to be your unwelcome guest. Both of these rodents may carry a variety of bacteria and viruses that can be spread through their feces, urine, saliva, fur and paws. In fact mice can be carriers of the common food poisoning bacterium Salmonella—they can spread this across your kitchen counters as they scamper around without you ever knowing they have been there. They can climb any vertical rough surface, jump up to 13” and cross wires and cables in your walls. A female mouse can have up to 10 litters of 6 each year. When you see evidence of these creatures in your home it is time to call The Pest Force. Evidence of rodents includes seeing them during daylight hours, finding feces, seeing gnawed items or tracks, finding a nest in a sheltered location or smelling the distinctive musty smell of house mice under a tub or in a cabinet. Do not vacuum large amounts of feces or nesting material as this will cause microscopic viruses and bacteria to become airborne. Use gloves to discard feces and/or nests and disinfect surfaces completely. If you are dealing with large amounts of feces, it is best left to professionals. Our Customer Service Specialist will schedule an appointment at your convenience for a specific time. At your initial appointment, your Pest Management Professional (PMP) will conduct a thorough inspection of your structure. This is the most important part of our treatment since it is vital that we discover the entry points the rodents are using to gain entrance to your home. Your PMP will use this opportunity to perform some basic exclusion techniques to block further entry in obvious areas like around pipes and utility egress and ingress, and under bathtubs, etc. He will prepare a report for you showing you other areas that may need to be addressed in eaves or crawlspaces or around door and windows. He will set traps to reduce the population. 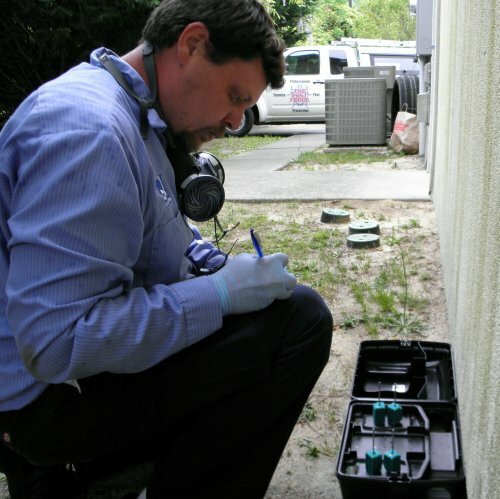 You will want to address any areas of concern immediately, and when available, your PMP will give you an estimate for The Pest Force’s Sensible Service division to accomplish these tasks for you if you so desire. Over the next week, your PMP will visit two more times to check the traps and access the situation. He will remove any carcasses and re-set traps. He may also move traps around during this time. At the end of the week, he will re-assess the situation and give you a report. It may be that the problem has been eliminated—hurray! Or perhaps, the infestation requires further treatment or monitoring. He will discuss the options with you so you can make an informed decision on how to proceed. In the case of large infestations, a combination of traps and poison baits may be used. In all cases successful rodent control will include exclusion (finding the source and eliminating access), sanitation and reducing the population. For our quarterly customers who see evidence of rodents, you can discuss this with your PMP who has a complimentary option available for you. To help avoid future rodent problems eliminate their sources of food and shelter! Store food, especially grains, pet food and birdseed, in rodent-proof metal or heavy plastic sealed containers. Sweep kitchen floors after food preparation. Rodent-proof your garbage cans by setting them on 6-in. high wood platforms. Make sure lids fit tight; use rubber cords to fasten them down if necessary. Replace garbage cans that have cracks or holes. Store them away from the house. Place wood piles away from your house. Search out holes (even small ones) around your foundation, eaves and soffits and fill them with copper or stainless steel mesh, cover with sheet metal, or fill with caulk, plaster or cement. Trim low bushes to avoid cover areas. Trim branches and shrubs away from roof. The Pest Force services the following areas for Mouse and Rat Control: Myrtle Beach, North Myrtle Beach, Little River, Longs, Conway, Carolina Forest, Socastee, Surfside Beach, Garden City Beach, Murrells Inlet, Litchfield Beach, and Pawleys Island.